The liner is the backing paper that makes up the web of a roll of labels. The release coat is a coating applied to the top surface if the liner. The release coat is designed to resist the adhesive, allowing the face stock and adhesive to peel away from the liner. Although the most common face stock material is paper, many other materials are used including plastic films, foils, fabrics and laminates. The top coat is a coating or lamination applied over the face stock, to provide physical protection from abrasion or to enhance some other property of the label. Top coats can be used to improve adhesion or legibility of secondary imprints, typically used for date or lot coding. Special UV sensitive varnishes or films can be used to assist with label on product detection, during the labeling process. The orientation of the copy on a label is an important consideration when specifying and automatic labeling system. The roll form and copy position chart below provides a standardized way to describe the eight possible combinations. 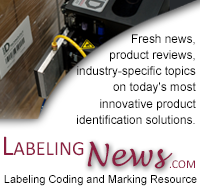 For automatic labeling applications, labels are typically wound out. Label size is defined based on the label's orientation on the web. A roll of labels consists of a sandwich of web and labels, rolled in a spiral around a core. The chart below describes the length of the web on a roll of known diameter, based on the thickness of the label/web sandwich. Read the rest of the guide to pressure sensitive labeling.